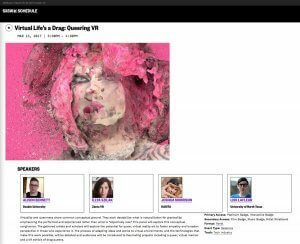 Virtual Drag generated a small buzz internationally in new media art circles. 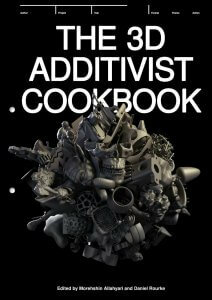 It has been featured on the uber cool UK based blog Prosthetic Knowledge, and picked up by Tumblr Radar. 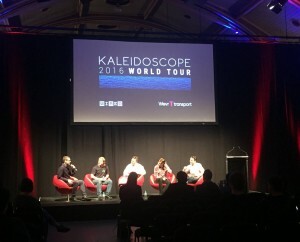 The computer game culture magazine KillScreen noted that the convergence of virtual reality and drag ‘realness’ opens a rabbit hole of accelerating conceptual possibilities. 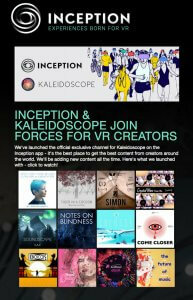 The Killscreen article was retweeted by @NEWINC, the art technology incubator of the New Museum. 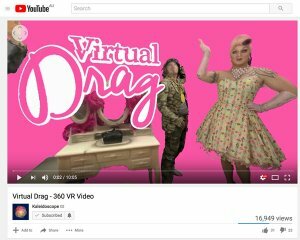 The New York based Creators Project declared “virtual reality art gets what it’s sorely been missing – drag queens.” The story has since been translated into French, Greek and Chinese. The work was strongly supported by the queer press in Melbourne. 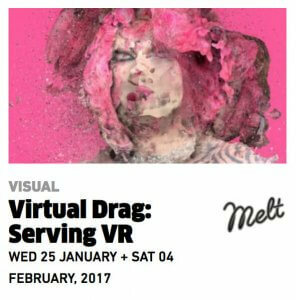 ‘Virtual Drag’ is a virtual reality encounter with 3D scans of drag queens and kings via virtual reality headsets and projections by Alison Bennett, Megan Beckwith & Mark Payne. 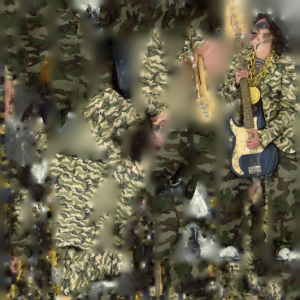 They have explored the potential of 3D scanning to create cyberspace encounters with the magnificent Philmah Bocks, the divine Art Simone, Jackie Hammer (a bit of a hot mess really … ), & the knee-weakening Transylvanian Gypsy Kings (aka TGK). 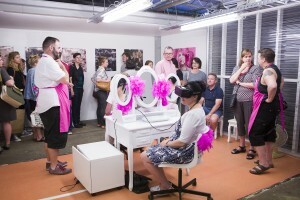 The virtual reality experience goes for about ten minutes and is comprised of four scenes built around the personalities of the drag personas. 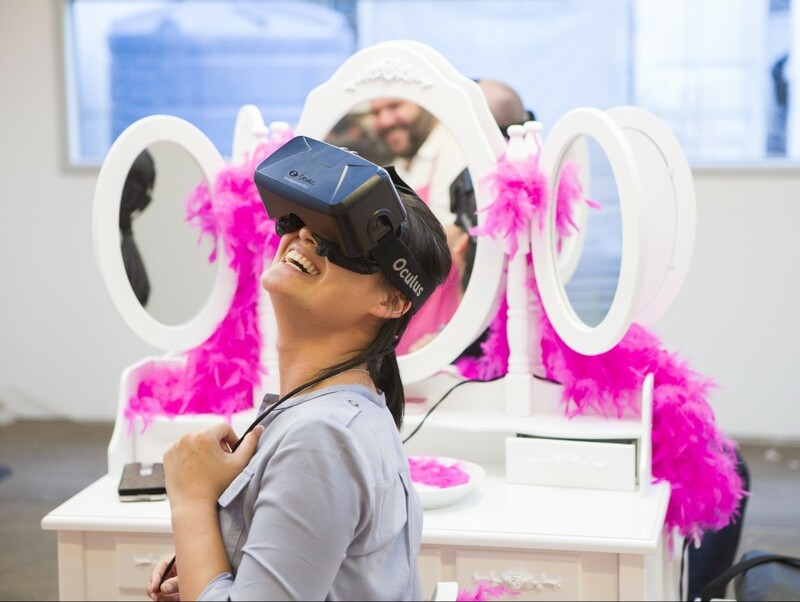 The virtual reality work is presented with the VR headsets resting on white dressing tables. The installation includes prints of the model ‘textures’ that reveal something of the process behind the work. 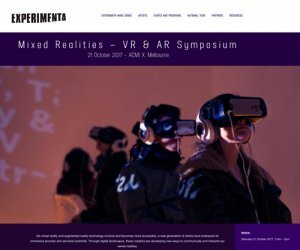 The VR installation can be complemented by video content projected on adjacent walls and live sound by the Transylvanian Gypsy Kings, who also appear in the VR experience. 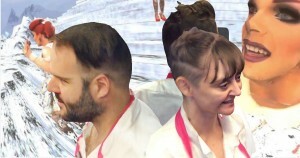 The models were created using a technique called photogrammetry that uses the shifts between photographs to construct a 3D mesh model of the subject with a surface constructed from a patchwork of the photographs wrapped around it. The glitchy imperfect quality of the process was not erased in order to explore the qualities of the process. The models were then animated with minimalist choreography by inserting armature and placed in a 3D computer games environment that allowed the viewer to look round the virtual environment in real time. 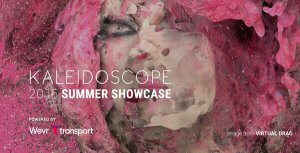 ‘Virtual Drag’ is a collaborative project by artists Alison Bennett, Megan Beckwith & Mark Payne. Alison Bennett is a neuroqueer new media artist who works in ‘expanded photography’. She is perhaps best known for her series ‘Inverto’ featured on ABC TV’s Australian Story “From Daddy’s Tummy”. 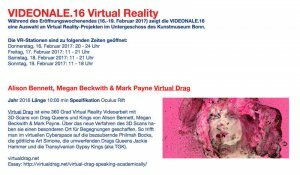 For ‘Virtual Drag’ Bennett collaborated with Megan Beckwith, winner of the inaugural Australia Post Art Prize, dance choreographer and 3D animator described by The Age as a ‘trailblazer’; and Mark Payne, an award winning designer and artist working with photogrammetry. As a team, they discovered an organic process that drew on their complementary skills and passions to create something bigger than the sum of the parts. 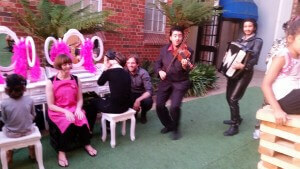 The project was assisted by the Australian Government through the Australia Council for the Arts, its arts funding and advisory body & Deakin Motion.Lab. 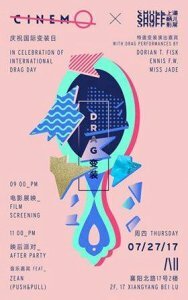 We think drag is important! It may be the most visible of queer identity performance but it is by no means vapid. Drag Queens are the warriors of gay pride. The gay rights movement has been characterised by a push back against gender roles and queering the performance of gender. It was transwomen, drag queens and butch presenting women that instigated the Stonewall riots. They were being arrested for cross dressing, not simply for being homosexual. So much of the early work in virtual reality has been driven by naked girls presented for a male gaze. 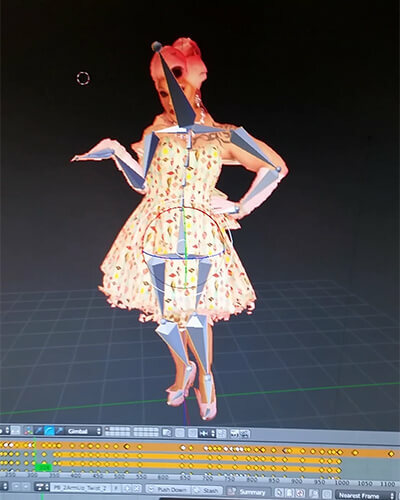 As queer new media artists, we are inspired by artists that ‘queer’ digital spaces such as Jacolby Satterwhite, a New York based vogue dance artist who presents his performance work in virtual digital spaces, and London based Zach Blas’ Queer Technologies project.